Chinese New Year travellers with Europe as their destination love Italy and Spain the most, while they are increasingly interested in spending their Spring Festival Holidays in Eastern European countries. These are some of the main findings of recently published reports on trends in Chinese outbound tourism during the last Spring Festival. While the South European countries Italy and Spain offer many cultural attractions and moderate temperatures even during wintertime, Switzerland is famous for winter sports in the mountains and Iceland for its many fjords, mountainous areas and its untouched wilderness. Eastern European countries, especially Serbia and the Czech Republic, are also gaining in popularity with Chinese visitors coming to Europe during the Spring Festival. They have become attractive not only due to their interesting cultural sites and beautiful landscapes but also because of the recent relaxation of visa regulations for Chinese tourists. That Turkey received the huge number of 194,789 Chinese visitors in this period comes as a surprise. It reflects, however, the success of local tourism agencies in compensating for a sharp decline in the number of visitors coming from Western European countries. Source: China Tourism Academy. 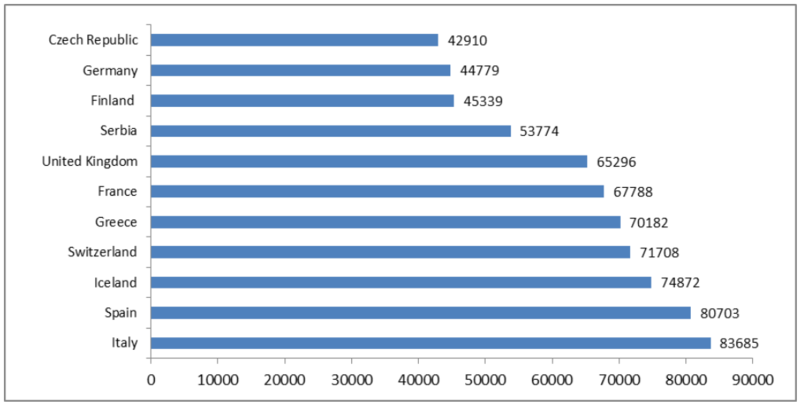 Estimates based on big data analysis. Among the most popular European cities that Chinese travellers preferred to visit during the Spring Festival 2018 were Vienna, London and Paris. This is not a new trend, but rather a confirmation that these cities are extremely attractive because of their historical sites, great variety of cultural events and the possibilities they offer for purchasing famous European brands. 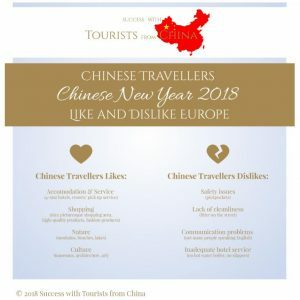 What did Chinese tourists like and dislike? We recommend you to take this list and check your offering regarding Chinese tourists, and to adapt it if needed. For example by adding some specialised services to your offering, or by describing your location – in particular regarding nature, culture and safety – in more detail. Thereby you can attract more Chinese tourists to your business! That Chinese tourists are eager to visit European countries is also the finding of a recent travel survey conducted by the European Travel Commission. According to this survey, 93 percent of the respondents who intended to travel abroad were likely to visit European destinations in the first four months of 2018. Following the Long-Haul Travel Sentiment Survey and Index, about 58 percent of Chinese respondents definitely planned to travel to Europe between January and April 2018. Experts relate this strong interest in Europe to the increased affluence of Chinese people, improved air travel connectivity and competitive airfares as well as more visa application centres opening across China.